This section of the site has been worked on since 2008. Blimey. 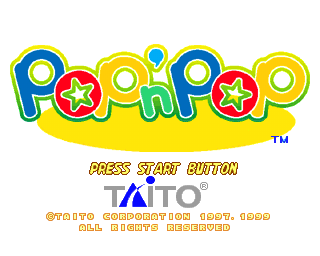 Pop n' Pop is a weird game. One of Taito's many, many puzzle games, it seems to have fallen off the radar, and this is something I blame entirely on the game not getting a proper US release. It's a wonderful mix of Space Invaders and Puyo Puyo, and has the added benefit of being chock-full of references to older Taito games, as the entire cast is culled mostly from their library of platform games. As such, we've dedicated an entire section of this site to stuff about this game, including some extra bits that aren't on this website at all. Such things include a full guide to the game's Checkmate Mode, 'Taito Love' (which is basically a list of references to other Taito games) and the Story Mode intros and endings for each character because they are fantastically translated. Please, enjoy. You might want to duck back to the index because this page is way too intense!